Jennifer Harbury’s investigation into torture began when her husband disappeared in Guatemala in 1992; she told the story of his torture and murder in Searching for Everardo. For over a decade since, Harbury has used her formidable legal, research, and organizing skills to press for the U.S. government’s disclosure of America’s involvement in harrowing abuses in Latin America, Southeast Asia, and the Middle East. A draft of this book had just been completed when the first photos from Abu Ghraib were published; tragically, many of Harbury’s deepest fears about America’s own abuses were graphically confirmed by those horrific images. 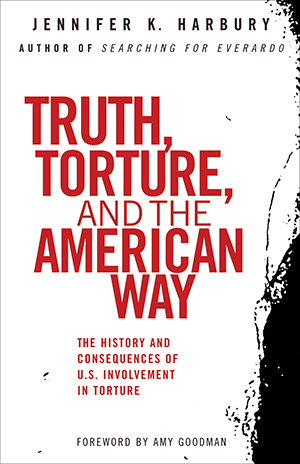 This urgently needed book offers both well-documented evidence of the CIA’s continuous involvement in torture tactics since the 1970s and moving personal testimony from many of the victims. Most important, Harbury provides solid, convincing arguments against the use of torture in any circumstances: not only because it is completely inconsistent with all the basic values Americans hold dear, but also because it has repeatedly proved to be ineffective: Again and again,’information’ obtained through these gruesome tactics proves unreliable or false. Worse, the use of torture by U.S. client states, allies, and even by our own operatives, endangers our citizens and especially our troops deployed internationally. "The word "torture" has always brought to mind the Gestapo, or the gulag. Jennifer Harbury shocks us as she confronts us with our own nation's record of torture and brutality, from Latin America to Vietnam to Iraq. She tells the story of her husband's disappearance, torture, and murder in Guatemala, but also presents the testimonies of other torture victims, with the C.I.A. a shadowy, ominous presence. Their stories make us feel shame at the betrayal of our most cherished values, but Harbury is undaunted, believing we must expose the truth and demand that our government not respond to the terrorism of 9-11 with the terrorism of the secret torture chamber." "A few bad apples? A small group of undisciplined soldiers? Read this harrowing, courageous book and you will discover that the torments of Abu Ghraib are deeply and systematically rooted in a poisonous American past." "Bully for this brave woman who, despite her personal tragedy, takes democracy more seriously than its alleged protectors. She is a patriot to put the pundits to shame."